Like many others I very much enjoyed the Laphroaig Live event from Islay last year after the successful first event in 2007. This year the event will be a bit different: It will take place at the Maker's Mark distillery in Kentucky. Yes, that's in the United States. One of the reasons is that Laphroaig is matured in Maker's Mark Bourbon barrels, the other apparently that John thinks it's sunnier over there than on Islay. Now let's go west over to the Rinns of Islay, to Bruichladdich. 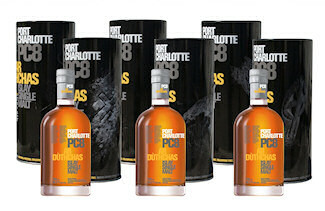 Again like many others I've followed the Port Charlotte Project over the years. I am the proud owner of an as yet unopened bottle of First Cut, for some reason created a video of opening the PC6 and earlier this year bought a bottle of PC7. Now the fourth and final release in the series has been released with the PC8. The series is called ‘Ar Dùthchas’, Gaelic for ‘land of our fathers’ or ‘land of our heritage’. While the previous tins were showing people (the distillery team and Islay people) this series now shows impressions of landmarks on the Rinns of Islay where Bruichladdich is located. 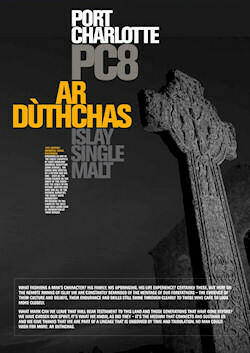 In the information sheet on the right you can see the Kilchoman Cross. It seems to be another very good whisky, winning the ‘Spirit of Whisky Fringe’ award (a public vote, not the usual publishers award). I'll have to see where I can get one down here, otherwise I'll have to wait until my next Islay visit in October. Really looking forward to it, I expect it to be even better than the PC7 I'm enjoying while finishing this entry.